French President Nicolas Sarkozy condemned the wearing of burkas on Monday, saying the traditional Muslim garment that covers women from head to toe was a "sign of subservience" and was not "welcome in France." 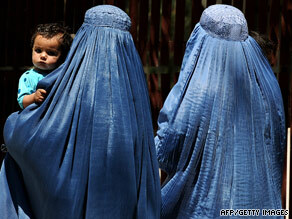 In a speech before a joint session of parliament, Sarkozy said, “The problem of the burka is not a religious problem. This is an issue of a woman’s freedom and dignity. This is not a religious symbol. It is a sign of subservience; it is a sign of lowering. I want to say solemnly, the burka is not welcome in France.” Sarkozy’s statement comes as debate rages in France about Muslim women wearing the covering, with some French lawmakers calling for a ban on them. “We cannot accept in our country women trapped behind a fence, cut off from social life, deprived of any identity. This is not the idea that we have of a woman’s dignity,” the president said. He urged parliament to further debate the issue.